Every client is unique. A client’s needs vary considerably depending on body size, weight, level of mobility and immediate medical condition. Bariatric clients often exceed a lift’s safe working load. This creates an unsafe working environment. Luckily, Waverley Glen has the answer: the C-1000. 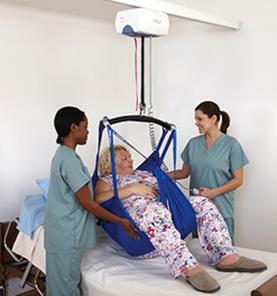 The strongest ceiling lift in its class, the C-1000 makes it possible to safely lift or transfer clients of all sizes with respect and dignity.